Killer Characters: Death by Estate Sale? Dolly Cavanaugh suggested my sister Veronica and I go to an estate sale in Georgetown, Washington DC. It wasn't far from my house. It was sad to see the belongings of a former Ambassador arranged haphazardly on tables and being sold. After all, they were treasures to him and his wife. Now they were being discarded for next to nothing. Dolly challenged us to select the most valuable item on a table of knickknacks. Boy, were we wrong! Veronica and I are going to go to more estate sales. We made a mint off a little item that Dolly pointed out. I would have ignored it entirely. But that evening, Dolly's life came to an abrupt end and a rare book that she bought at the estate sale had disappeared. I can't help wondering if there's a connection. What's the most amazing thing you ever found at an estate sale? THE COLORING CROOK is coming on November 29th. Krista is giving away TWO books today! The winners' choice of COLOR ME MURDER or an advance reader copy of THE COLORING CROOK. Leave a comment with your email address to enter! Please note that due to a previous giveaway snafu, the following people have already been entered in this contest: Dianne Bahn; Mama Hen; Deb; Claudia; traveler; Not really; and ptclayton. I went once and found an amazing book case and some great books. I love estate sales! I always look for cookbooks, children's books, and mysteries! Don't know if I am the Deb that has been entered, but if not, please enter me for the giveaway! Thank you for the marvelous chance to win one of Krista's book. Love this author's books! I've read "COLOR ME MURDER" and highly recommend it to anyone wanting a great book to read. If I were fortunate enough to be selected, I would be beyond thrilled to get a copy of "THE COLORING CROOK". I’ve only been to one estate sale. It was across the street and they gave us a couple of bird feeders and poles because it was near the end of the sale and they hadn’t sold. Oh oh, have to admit I've never been to an estate sale. Not sure why because I know it's not really like a yard sale,w which I don't enjoy. Have not been to many sales. Nothing interesting found. I have only been to a couple estate sales and haven't found anything I wanted (that I could afford!) 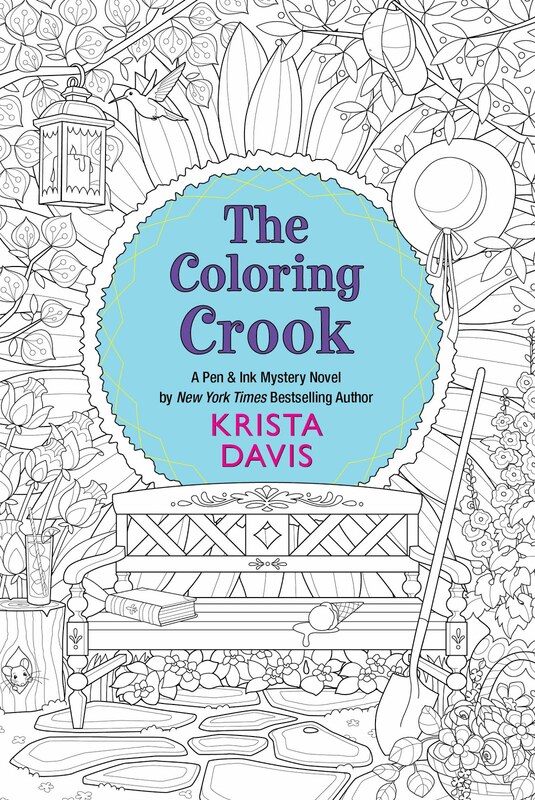 I have been wanting the Pen & Ink Mystery books from Kristin Davis for some time. Just need funds to buy! Thank you for the chance to get Color Me Murder book! Congratulations, Cheryl! You are winner #2! I used to be an estate and tag sale addict. I am somewhat reformed but I slip up and have binges. I love a bargain! I have never found a million dollar painting, so until I do I have to keep hunting. I have found some great Steiff stuffed animals very inexpensively. I found a very vintage tubed TV set for my son. LaurasReadingBlog@gmail.com I would enjoy either coloring book. It's a long weekend, The Coloring Crook looks like it would be a good read to wile away the days. I’ve only been to one estate sale—it was an auction. There were several Fenton glass pieces that I loved. Unfortunately, I got out-bid. It was fun, though. I’d love the advanced reader copy. The first one was such a fun read! kchinetti at gmail dot com. Congratulations, Susan. You are winner #1! I haven't been to an estate sale in ages. But I would love to find some Bakelite jewelry! Not that I'd be able to tell it was real though! lol. I love finding vintage cookbooks. I would love to give my mom a copy of Color Me Murder, she (and I) love to color. I've found some great stuff at estate sales, but you have to know what's a good deal and what's not. It's still fun just going to look. I’d love Color Me Murder. I've never been to an estate sale, but I think it would be interesting. 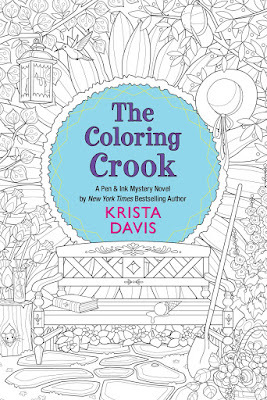 I'd love to win The Coloring Crook since I''e read the first book and loved it! mcastor07 (at) gmail (dot) com. I love mysteries and I love coloring! Thank for the giveaway! I have never been to an estate sale. Would love to go to one though. I haven't gone to many, but I am always on the lookout for white hobnail and Basset/coonhound items. I have never been to Estate sale. I have been to a yard sale. I am not sure if I would know a thing about the price of certain items. If I buy anything it is because the item speaks to me. I have been to a few estate sales but I haven't found anything good yet. I look forward to another "coloring book" by Krista. This is the entry for Penny Poe Harper. I stopped going many years ago because I don't need to add to what I have. I did get a couple of nice comforters for $2 each and still use them. That was a pretty good deal. Hi, Marlene Ezell here. I would love to win a copy of THE COLORING CROOK. I haven't been to estate sale in a while, but I am always looking for past Hallmark ornaments at them.